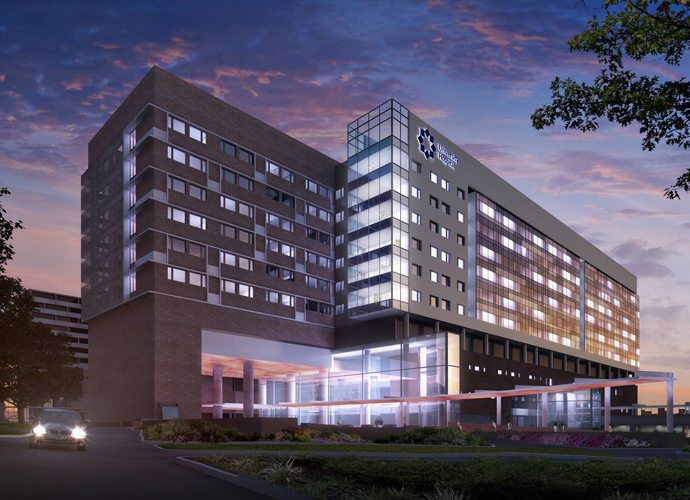 The New Sky Tower in the Medical Center is a ten-story hospital designed to house over 700 patient beds. This facility adjoins with two existing hospitals and two adjacent parking garages providing seamless access between all buildings. With such a substantial scope, the new Sky Tower Hospital required a great deal of coordination from all design teams involved. In order to circumvent existing piers within the construction site, concrete piers with pier caps were employed with special consideration. New piers were strategically located to avoid any existing piers from the previous structure and to not undermine adjacent structures. The new emergency driveway for the Sky Tower features a 60’ clear span with over 35’ of clearance above finished grade. After several schematic designs, the framing above the emergency drive spans the sixty feet utilizing 6 foot wide and 12 foot deep concrete beams. The coordination of specialty medical equipment such as MRIs and CT scanners proved to be a challenge. Not only do these machines require specific vibration and location criteria, but their magnetic properties also limit their amount of iron exposure. Utilizing a concrete floor system filled with mild reinforcement steel, equipment pathways and locations had to be finely tuned to account for the amount of stainless steel required. The Sky Tower was opened to patients on April 14th of 2014.